On Wednesday afternoons we welcome children who have communication difficulties, from approximately 2 years old, up to when they are in school full time. There's also a 'Speech, Sign and Song Plus' group once a month on a Saturday, for older children. Many of these children have associated issues with concentration, behaviour and emotional development, which can make it hard for them to make friends and to cope with the high level language, busy nature and the expectations of 'mainstream' community groups. Children in the group may or may not have a clear diagnosis such as Autism, Down's syndrome, Specific Language Impairment or ADHD. They may have other speech and language needs and/or Learning Disabilities. They may also have physical and/or sensory impairments and other medical conditions. What's different about this group? We keep numbers small (usually 8 but up to a maximum of 10) so we can give each child the chance to take part in their own way. We use simple clear language when speaking and singing, accompanied by Makaton signs and symbols. 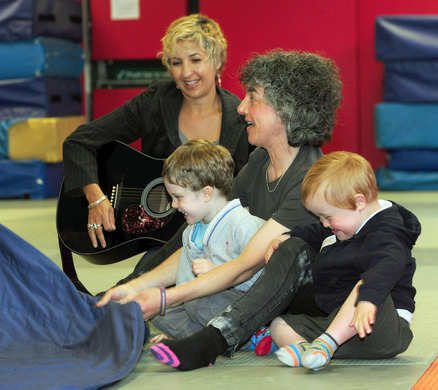 The group is run by two experienced pre-school music leaders, Roma Seth (Rockabillies) and Wendy Prevezer (Early Years Music Groups). Wendy previously trained and worked as a speech and language therapist. "My little ones have come on hugely in the time we've been coming...in many areas: tolerance of other children, understanding the activities and the order which we do things, taking an interest in the activities, interacting with the adults, and most importantly being happy and enjoying themselves. We are so happy to be part of this lovely group." To read more from our parents - click on 'quotes'.